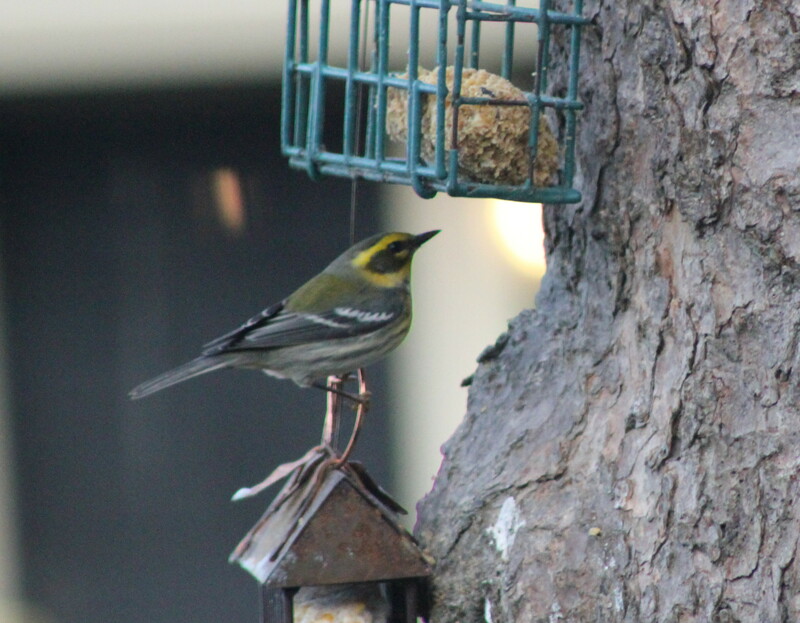 I am so jazzed tonight: new bird in the bird feeder – and a rare one for a bird feeder, at that. It was actually a pretty slow day for the bird feeder. It started frosty and cold, but once the sun was up, it warmed wonderfully. The birds tend to forage on their own when it is nice out. Still, I had a couple Eurasian Starlings come in. I was raised to hate starlings. They’re an invasive species, introduced from Europe, noisy and rather obnoxious. 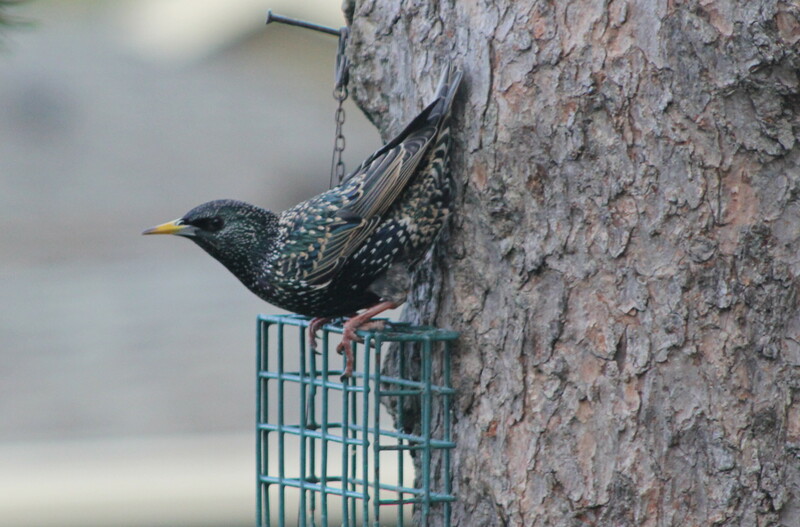 I have known a birder or two (or three or four) to take drastic measures to keep starlings out of the feeder. In fact, I have been known to quit feeding birds until the starlings move on. This winter I decided to watch them. I am beginning to see them in a different light (my dad would roll over in his grave if he was in a grave – probably a good thing we cremated him). They’re a rather showy bird with an interesting repertoire of songs. I don’t think I will ever actually like starlings, but I think I can get used to their presence. They are, after all, here and here to stay. 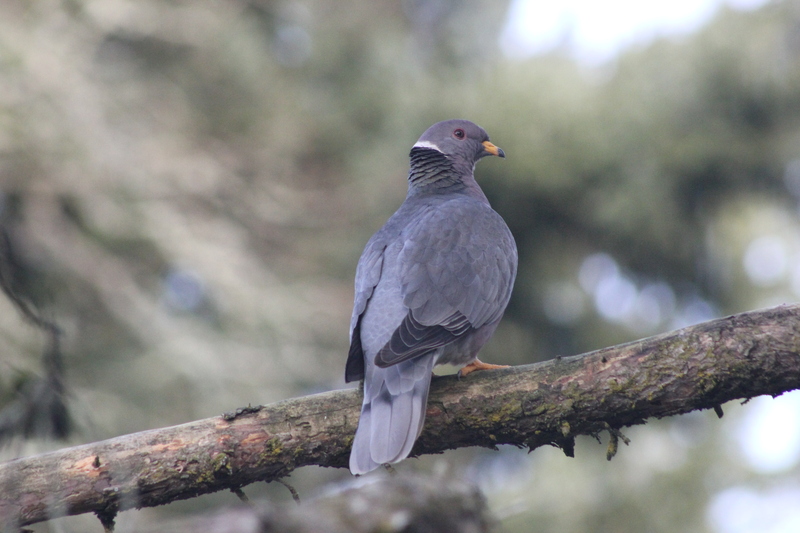 Two Band-tailed Pigeons dropped in. They didn’t stay long: my house is on a corner lot and people sometimes top at the stop sign for long minutes. Today someone got out and readjusted the load in the back of their pick-up and the pigeons decided not to hang out. They’re very shy birds, not at all like the rock doves you see congregating on public statues, under overpasses and on power lines. They are also native birds, unlike rock doves. And cleaner, I might add. I don’t like rock doves much. But that was it for birds until around 4:15 this afternoon, just before the sun went down. Then all the chickadees and usual little birds started filtering in. Or is that flitting in? They’re a nervous lot. My friendly Townsend’s Warbler always takes time to pose for my camera. But then there was the Stranger. At first I thought I had a lone Bushtit, but that would be unusual and this bird was considerably larger and slightly more yellow. It was too gray for a Goldfinch, but maybe a Lesser Goldfinch? I snapped a photo and hoped that it would come out. This was the best photo of the ones I took. The bird would never turn sideways to me and was entirely too nervous out in the open. I didn’t have the tripod set up to stabilize the camera (with the 75-300mm lens on it, the auto stabilization is not guaranteed to work). But the photo is adequate. I thought it might be a vireo because of the eye, but seeing a vireo in the feeder would be entirely unusual: they eat insects. 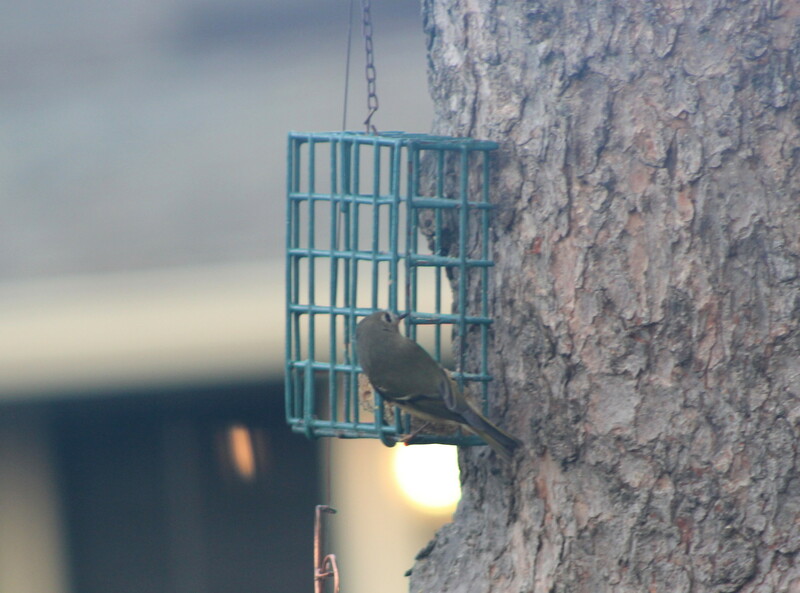 Still… that is insect suet, full of tiny bug parts for the bug-lovers. I usually check my birds against a couple different field guides when I am unsure about what I am looking at. Our old Peterson’s Guide that sits in the kitchen is reasonably reliable but I wasn’t satisfied with the choices. So I turned to the computer and the Cornell All About Birds web site. Ta da! I have a definite ID on this fellow: Cassin’s Vireo (used to be Solitary Vireo, which is what Peterson’s Guide called it). Wow! Those are amazing birds to view in your yard, Jaci. Love seeing them there. You have motivated me to go get some suet and see what might venture into my area. Great pics by the way too! you are inspiring me to put out some feed. I always look forward to spring (march) when I get a visiting woodpecker on the maple out my office window. I only wish I could take great pics like you. Keep it up. I enjoy them. It’s that new camera I got for Christmas. If I set up a tripod I would get even better pics. Hand held doesn’t quite do them justice. And yes – I want to see that pesky woodpecker that comes around to your house every year!! Great pictures Jaci! How exciting to have such a variety! I looked through my Petersons Guide; Birds of North America; Birds of the World; and even checked my What Bird Did That but can’t seem to find one. Perhaps you have discovered an new species? That would be even cooler!